Approved renovation of the existing 199-unit Amory Street affordable senior housing building, located on six acres steps from Egleston Square, and construction of approximately 353 mixed-income apartments across three new five-to-six-story buildings on site. Up to ten new affordable senior apartments would be added within the existing Amory Street Apartments. 135 apartments in the new buildings would be designated affordable, with the remaining 218 apartments offered at market rate. 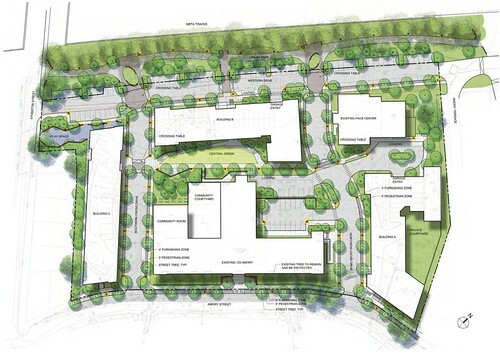 Approximately 262 parking spaces would be located on the proposed project site. As part of the proposed project, a new linear park would be constructed adjacent to the MBTA Orange Line. The development team expects to commence renovating Amory Street Apartments in the second quarter of 2018, and construction of the new buildings by the end of 2018. A building permit has been granted for the upcoming renovation of 125 Armory Street in Jamaica Plain. The project at 125 Amory Street in Jamaica Plain has secured $66.91 million in financing with a large portion ($45.21 million) provided by Eastern Bank. The approved renovation would consist of the existing 199-unit Amory Street affordable senior housing building, located on six acres steps from Egleston Square, and construction of approximately 353 mixed-income apartments across three new five-to-six-story buildings on site. Up to ten new affordable senior apartments would be added within the existing Amory Street Apartments. 135 apartments in the new buildings would be designated affordable, with the remaining 218 apartments offered at market rate. The Boston Housing Authority (BHA) issued a request for proposals for the 125 Amory Street property in July 2015 in an effort to preserve the existing 199 units at 125 Amory Street, and provide new housing on the adjacent vacant land. The project, the result of a partnership between the Community Builders, Jamaica Plain Neighborhood Development Corporation (JPNDC), and Urban Edge, will preserve the 199 existing affordable units, and build 145 new affordable units and 215 market rate units. 125 Amory Street is an approximately six acre site owned by the BHA. The renovation portion of the preservation of the existing Amory Street Apartments, including new windows, high-efficiency mechanical systems, accessibility improvements, reprogrammed and improved common spaces for 4 residents, facade repairs, and interior unit upgrades. Existing additions to the building will be demolished, and improvements will be made for parking and open space around the site. The building will include up to 209 units of affordable senior housing, including an additional ten units that will be constructed in areas currently used by the BHA, which will be relocated offsite. Common program spaces will be upgraded within the building, and residential parking will be re-organized with replacement spaces adjacent to the building. The project includes construction of three new residential buildings totaling approximately 308,950 square feet. Building A will be a six story building over parking with approximately 147 rental apartments, including approximately 37 apartments affordable to households earning up to 70 percent of the Area Median Income (AMI). Approximately 25 percent of the units will be two-bedroom or larger units sized for families. The building will include approximately 57 below grade parking spaces. Building B will be a six story building over parking with approximately 140 rental apartments, including approximately 35 apartments affordable to households earning up to 70 percent of the AMI. Approximately 25 percent of the units will be two-bedroom or larger units sized for families. The building will include approximately 58 below-grade parking spaces. Building C will be a four and five story building with approximately 62 affordable rental apartments, with approximately 76 percent sized for families. At least eight units will be set aside for residents earning under 30 percent of the AMI, with the remainder for residents up to 60 percent of the AMI. 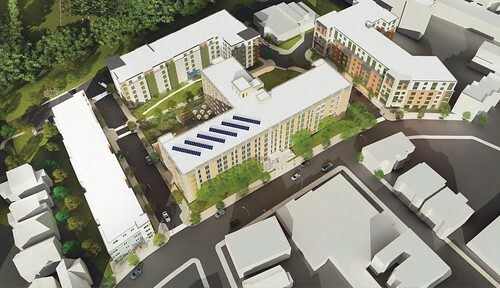 The proponents of the $150 million 125 Amory Street mixed-income development in Jamaica Plain have revealed renderings of the project’s three proposed new-construction buildings, as well as a site plan for the overall project. The new-construction buildings are designed to relate to the materials of adjacent warehouse buildings, the existing housing complex on site which would be renovated and overall neighborhood scale. Renderings of the buildings show large scale windows and bays, with stepped volumes to resonate with neighboring two- and three-family homes. The overall 125 Amory Street site plan calls for a new linear park along the MBTA Orange Line, with new community spaces and roadways throughout the six-acre site. 125 Amory Street would construct a total of 353 new apartments, 135 of which would be designated affordable, across the three new buildings. The existing 199-unit complex on site would be fully renovated, and ten new affordable senior housing units would be constructed within. 125 Amory Street’s proponents anticipate to commence renovation of the existing building in the second quarter of 2018, and construction of the three new buildings by the end of 2018. The latest renderings of 125 Amory Street are posted above. The project is now undergoing design review by the Boston Planning & Development Agency (BPDA). Jamaica Plain Neighborhood Development Corporation, The Community Builders and Urban Edge propose to develop a $150 million renovation and expansion of the existing Amory Street Apartments affordable senior housing complex in Jamaica Plain, located steps from Egleston Square and the MBTA Orange Line. The existing 199-unit complex would be fully renovated, and ten new affordable senior housing units would be constructed within the existing building. Throughout the six-acre Amory Street Apartments site, three new buildings would be constructed containing 353 new apartments, 135 of which would be designated affordable. The proponents have filed a Letter of Intent (LOI) with the Boston Planning & Development Agency (BPDA) signaling their intent to develop the project, and will file a Project Notification Form (PNF) with additional details in the coming months. The proponents anticipate to commence renovation of the existing building in the second quarter of 2018, and construction of the three new buildings by the end of 2018.